In the second edition of Frame The Star, 30 deserving semi-finalists got the opportunity to spend a day framing two elegant Mercedes-Benz cars, amidst the dizzying urbanscapes of Mumbai and Delhi, however or wherever they wanted! We bring you Better Photography's favourite images from India's most unique automotive photography and film-making competition. When engaged in a face-off like Frame the Star, you are challenged in a variety of ways. 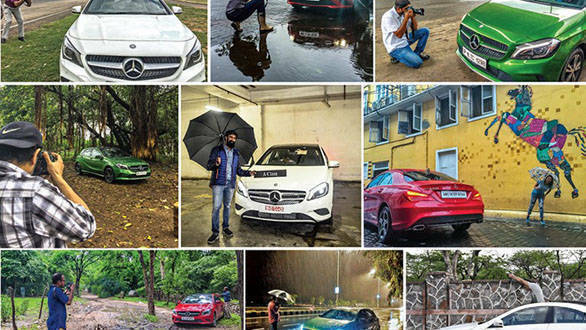 In the second edition of this competition, we asked our 30 participants to visually showcase two stunning cars, the Mercedes-Benz CLA and the Mercedes- Benz A-Class, in a day, set against the unforgiving concrete jungles of Mumbai and New Delhi. After a round of entries from an online contest, 11 photography and four videography contestants were selected for the semi-final.
" while incorporating the elements of a certain lifestyle within the cities. With their eyes on the finish line, the artists pushed the limits of their creativity and scoured the city in search of the best places to execute their vision. As we move ahead, the contestants' images will be assessed by a panel of eminent judges, well versed in the creation of stunning frames with a stylish subject. After this, three winners from the photography category and two winners from the videography category will battle it out in the final round. The stakes are high and the contestants stand to win a drive experience with Mercedes-Benz and the very symbol of luxury and excellence itself - a Mercedes-Benz for a year! You can view some of the photographs from the Delhi leg here.